The human papillomavirus (HPV) vaccination school-based programme for girls aged 12–13 years began in Ireland in 2010. Initially, the proportion of students who completed the vaccination course was above 80%, increasing to a high of 86·9% in 2014–15 (figure). No variance was seen between schools of different religious ethos, although disadvantaged schools had a lower mean uptake than other schools in 2013–14 (79·4% vs 85·0%; difference 5·58%, 95% CI 2·69–8·21).2 However, the proportion of girls who completed the vaccination schedule in 2015–16 dropped to 72·3%, and uptake of the first dose decreased further across all areas to an estimated 50% in 2016–17. 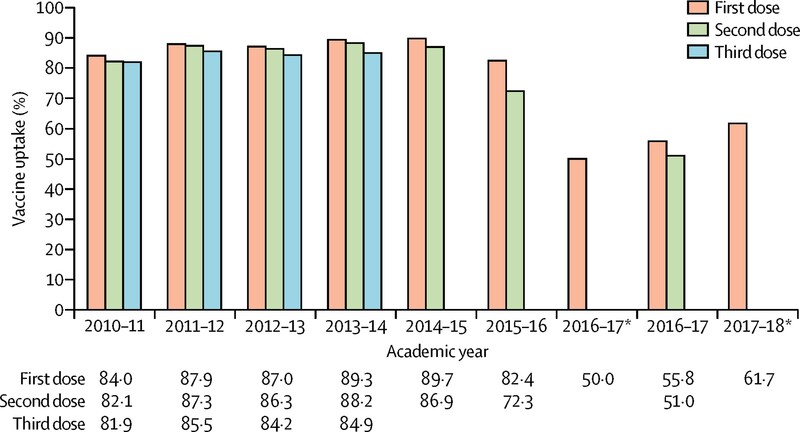 This decline in vaccine uptake was due to parental concerns about vaccine safety that were spread by lobby groups established in 2015. The groups built a strong social media platform with emotive personal narratives, and they lobbied politicians and distributed misinformation, with support from local and national media. This publicity resulted in the documentary Cervical cancer vaccine—is it safe? being broadcast on national television in December, 2015, containing footage from a similar Danish television documentary. Regaining parental trust was difficult without direct contact, so we at the Irish National Immunisation Office established a steering group of concerned organisations in early 2016 to encourage all key stakeholders to actively promote the vaccine. Focus groups on parental attitudes to HPV vaccination were held and we intensified our analysis of and activity on social media. The results of these activities assisted us in establishing liaisons with educational, parental, political, and other bodies, and in light of the results of the focus group discussions and analysis of social media, we revised print and online materials—including short videos on our WHO accredited website. Additionally, a comprehensive training programme was implemented for health professionals, enhanced by the production of e-learning modules. In August, 2017, the HPV Vaccination Alliance was launched. The alliance consists of a group of over 35 different organisations working in the areas of health, women’s rights, child welfare, and wider civil society that are committed to raising awareness of HPV vaccination. In 2017–18, a media campaign was launched featuring vaccinated girls, which was strongly supported by the HPV Vaccination Alliance and senior politicians. A wide range of groups now promote the vaccine, which has had an immediate impact. Unvaccinated girls were offered another opportunity to be vaccinated and the first dose uptake increased in 2016–17 to 55·8% and to an estimated 61·7% in 2017–18. Forming powerful cross-sectoral alliances has led to this rapid improvement in vaccine uptake, which contrasts with what has been seen in other countries that have had similar steep declines in vaccine uptake, such as Japan and Denmark. It is vital that this positive momentum is maintained to decrease morbidity and mortality from cervical cancer.